I received this eloquent form letter from James Duff, Creator, Executive Producer and Writer of The Closer and Major Crimes today talking about the ending of The Closer and the beginning of Major Crimes. 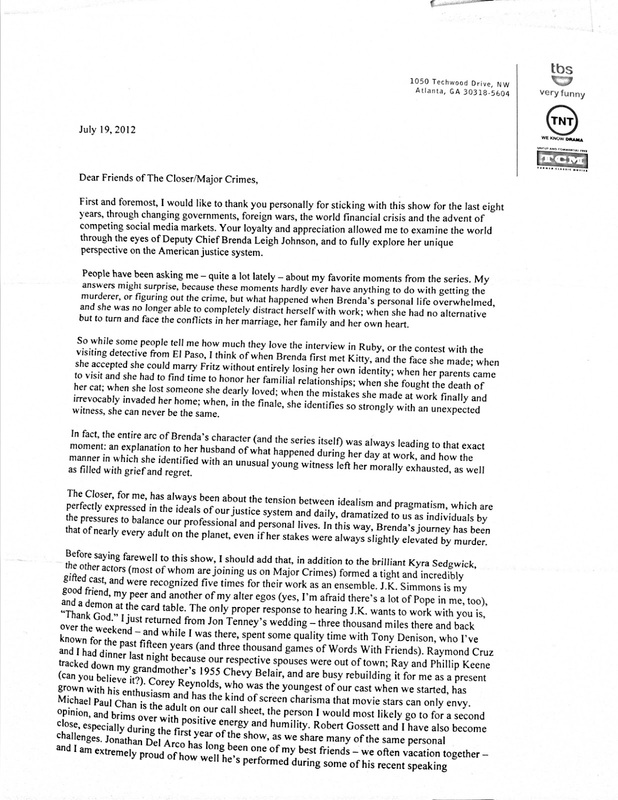 I apologize in advance for the poor scan quality, but I think it's still readable. It's a really nice touch for the final season of a great show. 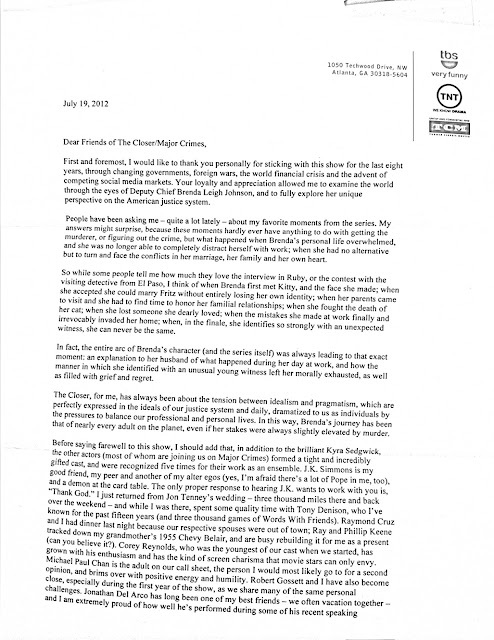 This is my favorite part of the letter, "The Closer, for me, has always been about the tension between idealism and pragmatism, which are perfectly expressed in the ideals of our justice system and daily, dramatized to us as individuals by the pressures to balance our professional and personal lives. In this way, Brenda's journey has been that of nearly every adult on the planet, even if her stakes were always slightly elevated by murder." Brenda has leaned towards being the pragmatist and Captain Sharon Raydor of the new Major Crimes show has been more of an idealist. Raydor has inched towards Brenda as she has seen her effectiveness so it will be interesting to see what happens when she takes over. I've loved watching The Closer and I'm sad to see it go. They've done a brilliant job of showing the social cost of closing or not closing a case. I'm recapping the last few episodes of The Closer and the first of Major Crimes at Criminal Element. You can read the recaps here: (Hostile Witness, Fool's Gold, Drug Fiend). 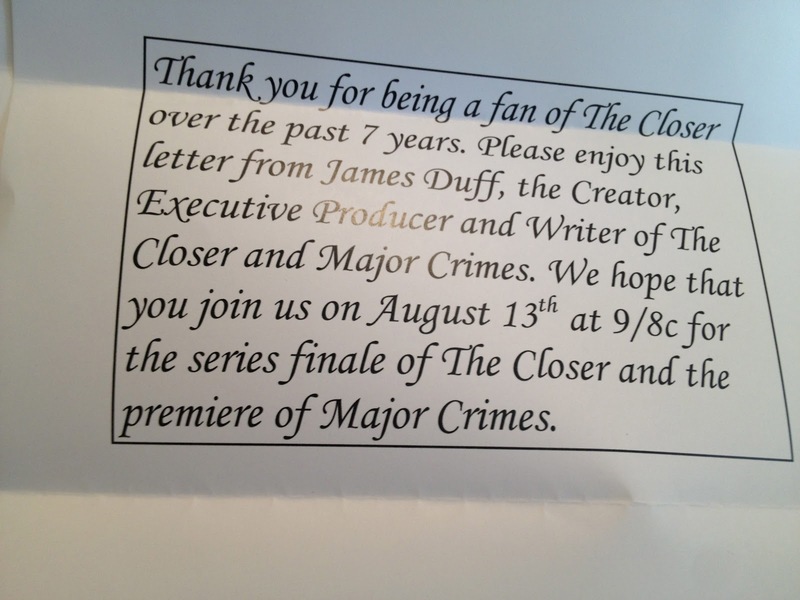 James Duff also has written two blogs about this season of The Closer for the Huffington Post. You can read those here. You can read other blogs I've written about both The Closer and Major Crimes here. Thank you, James. I do plan to watch Major Crimes. Is there a philosophical basis for Brenda's monologue about pragmatism vs. idealism in Serving the King Part II outside of the writers of the show? Such a speech was very out of place in what is otherwise a procedural, mind you an extraordinarily well constructed procedural with lots of interesting twists and turns. That said I am hooked on those words and can't get them out of my mind and wondering where else they lead. I would love to hear more of the back story on how this monologue was inserted into that show. It is definitely one of the more unusual moments in television.